If there is one thing Mini Me loves, it is dogs. There is absolutely no denying that dogs are her favourite animal ever. Add in a love of small role play toys too and Puppy In My Pocket is the perfect collection of toys for her. 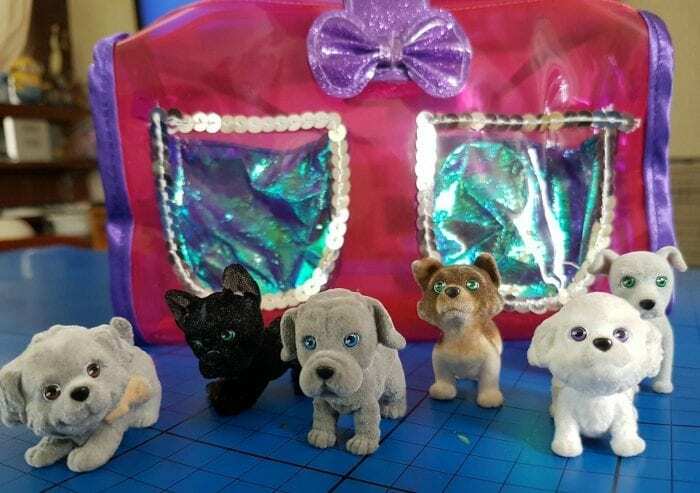 We were recently sent some blind bags (each containing one puppy per pack) and a Soft Carrier (includes four puppies) from the range of collectable toys that has been around since the 1990’s. The Puppy In My Pocket brand has evolved somewhat since then and there are over 100 miniature puppies to collect in the range… much to Mini Me’s delight! You may well be lucky when opening a Blind Bag (priced at £2.49) and find an ultra-rare glitter puppy! The puppies have a soft, flocked appearance and the cutest faces! Each puppy has its own name and identity alongside a unique bio based on realistic dog breeds. The Soft Carrier (priced at £12.99) is a bright pink, strong perspex purse with two pockets to showcase your favourite puppies and a handle. Complete with four puppies in the set, you can carry your Puppy In My Pocket collection around in style. You can imagine that wherever Mini Me goes, the Soft Carrier purse follows! The Puppy In My Pocket range is ridiculously cute and even I have to admit that I am hooked on them! They are made of a high quality flocked outer and are large enough to not be a worry, but small enough to still have the cute factor. The full range does include play sets which Mini Me will no doubt be including on her Christmas List… with Kitty In My Pocket being introduced later this year. Puppy In My Pocket is part of the Flair range and is available from all good toy retailers, including Smyths. Check out Mini Me’s first Blind Bag opening Vlog and see her reaction to the Puppy In My Pocket range!